On my first trip to Sweden in 1998 I fell in love with prinsesstårta (PRIN-sess-TOHR-tuh). The spongy layers of cake alternating with jam, vanilla custard and whipped cream topped with a thin layer of bright green marzipan had me hooked from the first bite. But it wasn’t until recently that I really started to wonder about this cake and it’s origins. Is it Swedish? Why is it called princess cake? Why is it typically green and how is it made? So the search began for more information on prinsesstårta. Jenny Åkerström is credited as the originator of the recipe. Åkerström was a Swedish home economics guru at the beginning of the 20th century and was even an instructor to the three Swedish princesses, Margaretha, Märtha, and Astrid, daughters of Prince Carl (brother of King Gustaf V). 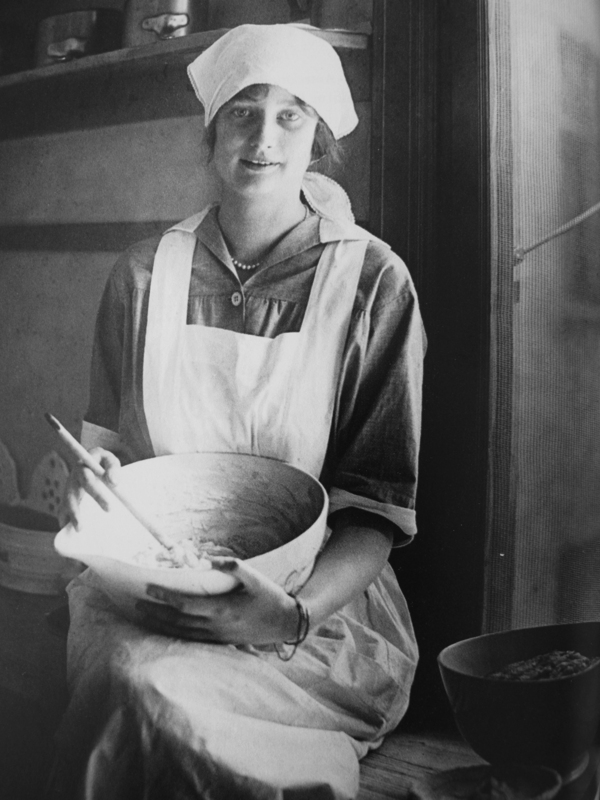 She published a four volume series of cookbooks called Prinsessornas Kokbok: Husmanskost och Helgdagsmat (Princesses Cookbook: Home Cooking and Holiday Food). The first edition came out in 1929 with the princess’ portraits gracing the cover. With it’s great success came eighteen reprints with revisions up through 1952. 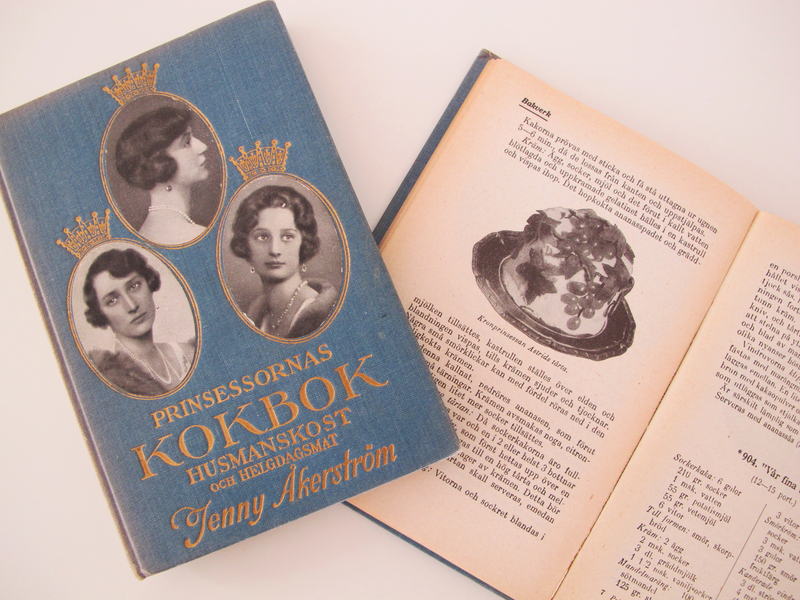 I wasn’t able to find any definitive information about why the books were called the princess cookbooks or why the princesses agreed to have their images on the cover other than the fact that Jenny Åkerström was their teacher and the princesses were seen as role models. Their education included child care and cooking which was innovative at the time. In a feminist sense, formal domestic training highlighted the professionalism required to manage a home and children. Perhaps ‘domestic princess’ is the pre-cursor to today’s elevated ‘domestic goddess’ status. Princess Astrid who married Crown Prince Leopold and became the queen of Belgium. She tragically died in a car accident at age 29. Being a preservation gal at heart, I couldn’t resist going online and finding a first edition of the Prinsessornas Kokbok. I am now the proud owner of a lovely, vintage set of the cookbooks and can definitively report that the original edition does not have a recipe for a cake anything like the prinsesstårta that is so popular today. So I enlisted the help of hembakningsrådet (the Swedish home baking council) who had access to several editions of the Prinsessornas Kokboks. The recipe doesn’t appear in the 1937, 1945, or 1952 editions, but there IS a recipe for Grön Tårta (green cake) in the 1948 edition and hembakningsrådet confirmed it is the prinsesstårta recipe as we know it today. For whatever reason the recipe was dropped from the 1952 edition, but the name Grön Tårta explains the green color. 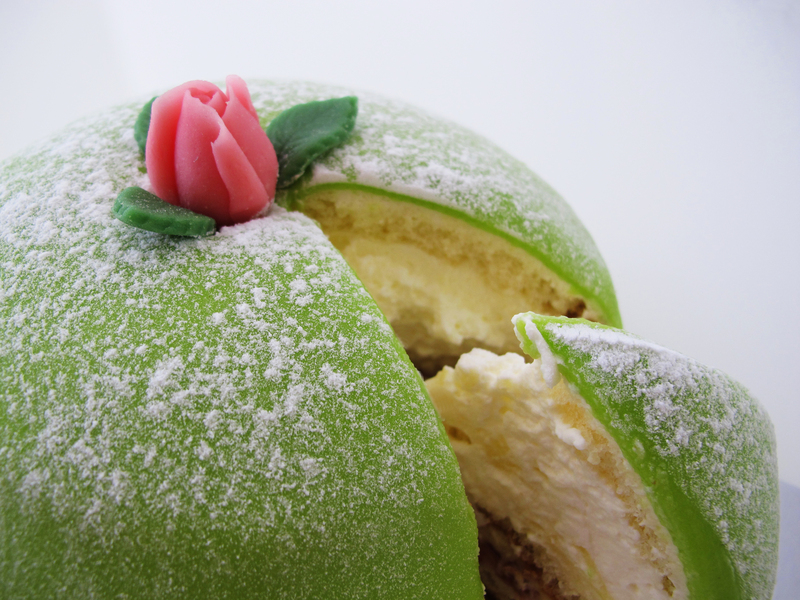 As far as the name of prinsesstårta, it’s certainly more appealing than “green cake.” The official Swedish baker’s association (Sveriges bagare och konditorier) states that the cake obtained the name prinsesstårta because the princesses loved the cake so much. And they weren’t alone. It quickly became popular in Sweden and Finland. Every year around 500,000 prinsesstårtas are sold in Sweden. The third week in September is officially prinsesstårta week. For every prinsesstårta purchased in Sweden during this period 10sek ($1.50) is donated to Crown Princess Victoria’s Fund that benefits chronically ill and disabled children and adolescents in Sweden. Prinsesstårtas that are topped with a gold crown are part of the fund-raising effort. Aside from all of the historical background, I was curious how prinsesstårta is made. The dome of cream is certainly impressive and I wondered how it was accomplished. In searching the internet I found a variety of recipes and methods. Some of the recipes had odd ingredients from buttercream to soaking syrups and some of the methods were as complicated as laying strips of cake into a bowl, adding the various layers and then inverting everything. That just seemed waaaay too complicated. So I headed to my fabulous local bakery, Conditori Tessina (the same place that makes my favorite rye bread), where the long-time owners Bosse and Ulla Fehrm graciously let me pop in at 5:30am one morning to see how they assemble a prinsesstårta. 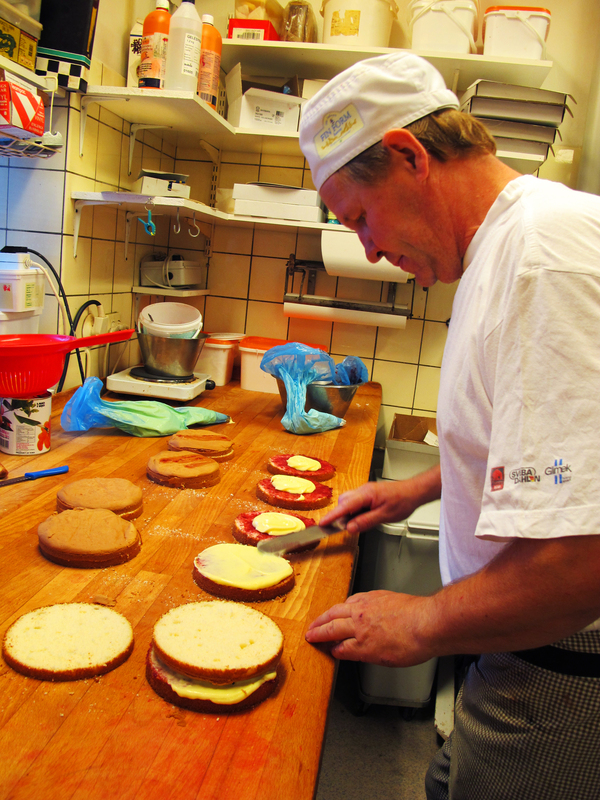 Ulf was the kindhearted baker who let me stand over his shoulder while he whipped up three of the cakes. First of all, a sponge cake is sliced into three even layers. I have got to get one of these handy saws. The cake is built up out of several layers. There are often slight variations among bakeries. At Conditori Tessina they start with the sponge cake, then a layer of raspberry jam, vanilla custard, another layer of sponge cake, more vanilla custard, and a generous mound of stiffly whipped cream over which the final layer of sponge cake is loosely pressed into a dome. After applying a very thin coating of whipped cream it’s time for the marzipan. The traditional color is green but you can find all sorts of variations such as the blue in the photos. Pink is quite common. For Halloween I’ve seen orange, red at Christmas, and yellow at Easter. The trick is to get the marzipan in an even, thin layer. They have a mechanized roller to get it perfect at the bakery. I don’t know if a pasta machine would work well for a home cook otherwise you would need some splendid hand-rolling capabilities. After laying the marzipan over the cake it is shaped by hand and trimmed around the base. The final touches are a dusting of powdered sugar and a pink marzipan rose with leaves. 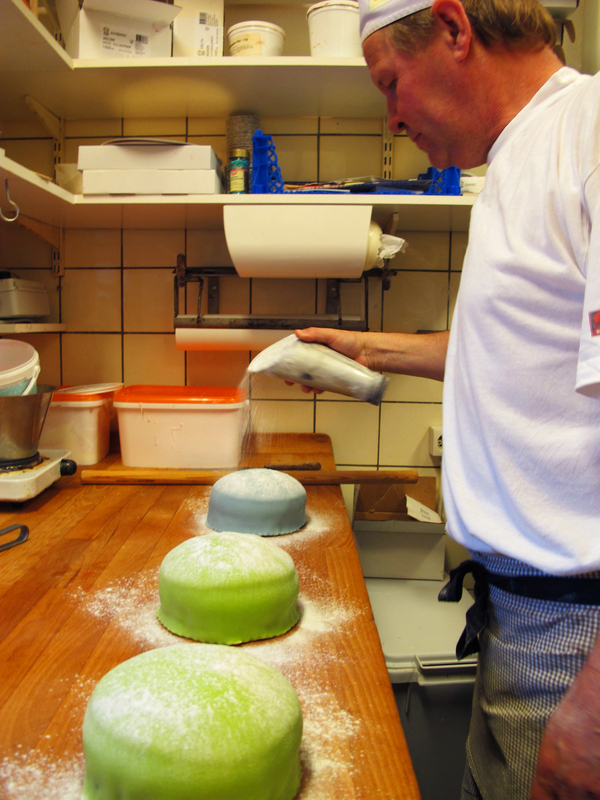 It took Ulf about 10 minutes to assemble these three cakes but he’s been doing it for 20 years so cut yourself some slack if you are giving this a try at home. My brief peek into the back-of-house at a bakery was a real treat. I nearly skipped home with the birds singing brightly at 6am. Not only was Prinsesstårta demystified, but I smelled like powdered sugar the rest of the day which was much better than the enchilada smell I used to carry around from my first job as a waitress at El Sol Mexican Restaurant (an ironically windowless establishment). It must be said that not all prinsesstårtas are created equal. Of course I am partial to Conditori Tessina but my father-in-law, who is a great lover of Prinsesstårta, confirmed that the one I shared with him from Conditori Tessina was certainly one of the best he has tasted. So there you have it. A biased, and an unbiased opinion of the excellence at Conditori Tessina. Many thanks to them for sharing their skills. Perhaps together we have demystified prinsesstårta and helped to provide a guide for those of you in the far reaches of the internet world who wish to undertake making a prinsesstårta at home. If you are so inclined, best of luck to you in your endeavor. As for me, I’m feeling pretty lucky to be in the Conditori Tessina neighborhood. 1. Preheat the oven to 350°F (175°C). Thoroughly butter a 9″ x 2″ (2 liter) round baking pan. Toss in enough breadcrumbs to cover the bottom and sides of the pan and shake them around to ensure all surfaces are covered (the same as you would typically do with flour when baking a cake, you are just using breadcrumbs instead). 2. Place the eggs and sugar in a mixing bowl and beat on high speed until light colored and fluffy. 3. Blend the flour and baking powder together and carefully fold them into the egg and sugar mixture until thoroughly blended. Pour the batter into the prepared baking pan and bake in the lower portion of the oven for about 40 minutes or until golden and a toothpick comes out clean. Let the cake cool slightly in the pan before turning it out onto a rack to cool completely. Place the cream, egg yolks, potato flour, and sugar in a small saucepan and whisk together (do not use a steel whisk as it can turn the custard grayish). Cook over low heat, stirring constantly, until the custard thickens. Remove from heat and stir in the vanilla. If cooking the custard with potato starch flour you need to use the custard shortly after you make it. If using corn starch the custard can be prepared a day ahead and stored in the refrigerator. 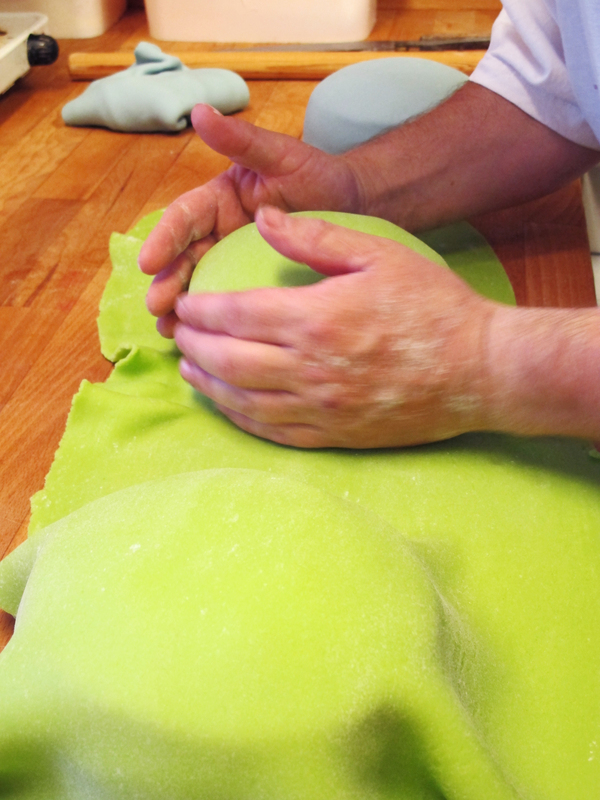 Knead the marzipan with your hands to soften it up and add the green and yellow food coloring sparingly until you have achieved a bright, spring green. Flatten the marzipan into a disk. Place it between two pieces of parchment paper or on a smooth surface dusted with powdered sugar and roll it into a thin, even circle ideally about 1/32″ (just under 2mm) thick but do the best you can to thin it out. Keep in mind the circle has to be large enough to cover the entire cake. You can dust the marzipan and work surface with powdered sugar if need be to prevent sticking. Once the sponge cake has cooled completely, slice it into three layers keeping the top layer a bit thinner than the others. 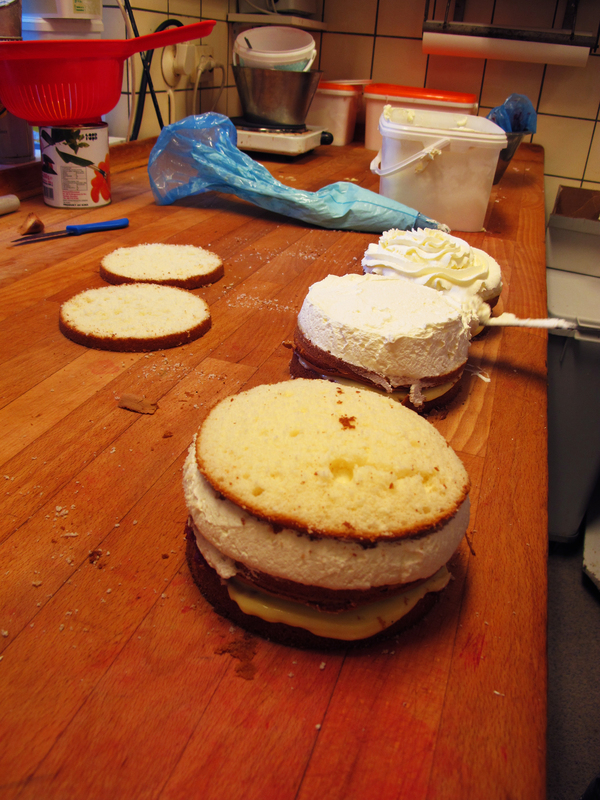 Start to assemble the prinsesstårta by spreading a thin layer of jam onto the bottom layer of the sponge cake. Add a generous layer of vanilla custard by either piping or spreading it over the jam. Add the next layer of sponge cake and another generous layer of vanilla custard. Whip the 2 cups (480ml) of heavy cream until stiff and pile a generous, fluffy mound onto the last custard layer. Add the final layer of sponge cake and gently form it into a dome shape over the cream being careful not to squish too much cream out of the sides. Spread a thin layer of cream over the top to even out and seal the surface. Gently lay the thin marzipan sheet over the top of the cake and use your hands to help define the shape. 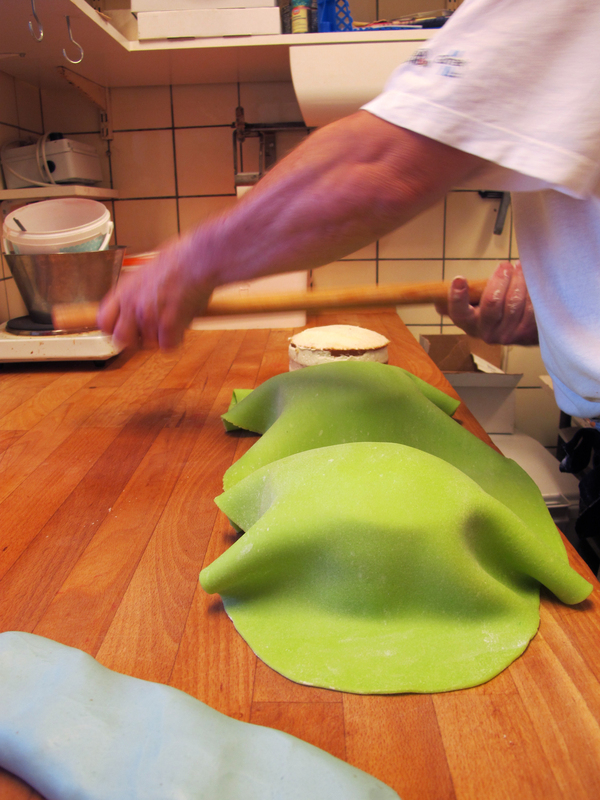 Trim the excess marzipan from the bottom of the cake by using a pizza or pastry wheel or a very sharp knife. Dust the top with sifted powdered sugar (you can use a tea strainer) and garnish with a pink marzipan rose with leaves. The cake needs to be refrigerated until serving time and any leftovers need to be refrigerated as well. Ideally the cake should be eaten the day it is made. Love the look of this and think we might be trying it at home this weekend. I’ll let you know how it turns out. Oh my goodness! You went to great lengths to figure this out! I’m very impressed and I’ll be trying one of these cakes soon. Hey Stephanie. Not sure where you are located, but if you are at a high altitude you might check out the comments my sister made. It seemed to have a big impact on the final result. If you do give it a try, I’d love to hear how it turns out. Prinsesstårta är min absoluta favorit av svenska bakelser och tårtor-minns barndomens tjafs om vem som skulle få marsipanrosen! Incredibly interesting and well illustrated investigation. We love the taste of the sponge cake but we are in the process of making adjustments to the recipe for altitude. We have had the cakes collapse each time we have tried to make them, (three now.) Thank goodness we raise chickens and have lots of eggs. We made the custard which is delicious and is patiently waiting with spoonfuls disappearing periodically to the girls. We will probably need to make more of that when we get the cake recipe tweaked enough. Looking online for adjusting sponge cake for altitude they recommend, reducing sugar up to 25%, reducing leavening 1/4 to 1/2 tsp, adding additional flour, 2-3 tablespoons, cooking it at 25 degrees higher than the recipe calls for, and when beating your eggs, don’t over beat them, in fact, when they are just starting to change color to look frothy, then fold in your flour, don’t wait until they are light colored and fluffy or you have beaten them too long for high altitude suposedly. We will let you know how this works out from our perspective when we are succesful with making our sponge cake. Success!!! We made the sugar a scant cup, used 3/4 tsp baking powder, added two tablespoons more of flour, whipped the eggs and sugar until they were just starting to fluff and baked it at 375 degrees for about 25 minutes. Our altitude is 4400 feet approximately and this cake didn’t fall. The girls helped to make the cake and tonight we cut the one made like above worked beautifully. We sliced it into three layers, Katherine spread on the raspberry jam and Vivian put on the custard. I did the whipping cream and Ross rolled the marzipan out. Vivian also made the rose for the top. It didn’t look quite as nice as the one pictured here but it tasted great. Thanks for passing the information along to us. The Utah cousins are enjoying trying out their Swedish cousins heritage. Oh good. So interesting that the high altitude changes were so key. But sponge cake is not easy. I remember many of my early attempts at making the sponge cake for a Swedish birthday cake and having to make another cake because the first one fell. Folding in the flour can be really tricky but it sounds like you needed to really make some changes based on your elevation. So glad it worked for you finally. It was fun to see the photos on facebook. It was a real family project. Lovely pictures and very interesting info about my favourite cake Prinsesstårta! I prefer it with green marzipan and the pink rose on the top! In Stockholm, I used to buy just a slice of it (=bakelse) to cheer me up after an exhausting day of shopping. Thanks Eva. I think I just had one of those kola-kakor for a little sweet after lunch out today. I love them too. Thanks for sharing the recipe link. It really was fun to make. My “Princesses” had a great time putting their cake together. Ross didn’t have much fun rolling out the marzipan but bless his heart, he kept rolling until it was big enough to cover the cake. if you want an evenly rolled out anything by hand; try using to pieces of square sided dowel that are as tall as you want your product to be thick. place the dowels on ether side of what you are rolling out and roll away. I’ve used this trick with everything from clay to biscuits and fondant, works like a charm every time. What a great tip! Thanks for sharing. I am delighted to have discovered your blog. I am a real Sweden-o-phile! I have visited 12 times, and my goal is to live in Sweden for 13 months. We shall see. I loved learning more detail about this history of the Princess torte. I made my first attempt at one about four years ago–and posted it to my blog, if you care to take a look. When I was 12, I wanted a penpal. Once a year, my mom’s older sister would get a letter from Sweden, from Anna Larsson, and I asked her if she could find me a penpal there. Luckily, Anna asked a boy “down the lane” if he would write to me, and so it began. Sven-Eric (who is also a relative) and I wrote sporadically over the years, and in 1981, when I was 27, my mom and I made our first trip to Sweden. I was excited to meet Sven-Eric (who by now lived in Upssala) and was looking forward to traveling with him to Nås to meet his mother and Anna Larsson. Imagine my surprise when I learned that there would be 16 relatives coming to dinner to meet us! That began my love affair with Sweden and my relatives there. Sadly, the older generation has all passed, but there are still plenty of wonderful relatives who treat us like royalty when we visit. On my second visit to Sweden, my relatives gave me a gift of a Nås dress. I have worn it here on several occasions, and it has made many trips back to Sweden for midsummer there. If you go to my blog and click on the tags for Sweden and Swedish Cabin, you can see more about my love for Sweden! Oh, and thanks to your blog, I have an ostkaka in the oven as I’m writing–my first attempt at one. I’ll let you know how it turns out! What a lovely story. I have found that my relatives here have also been very welcoming. It’s a really nice feeling to have my own connection to Sweden and they are such nice people. Definitely let me know how the ostkaka turns out for you. I’ll also be interested to hear how much sugar you decided to use. Good luck with your presentation! I’m glad you found the information helpful and I hope your cake turns out fabulously. Hi there – Just stumbled across your blog, it’s fantastic! I was an exchange student in Gavle back in 1999/2000. I have a recipe for Kladdkaka med Kolasmak and have been trying to figure out what the equivalent for ‘fine baking breadcrumbs’ is in the US. Any ideas? I see this recipe seems to call for something similar. Any help would be appreciated. I’ve used cornmeal and it’s ok but a little chewy 😉 Thanks in advance. Hi Rachel. So glad you found the site and are enjoying it. 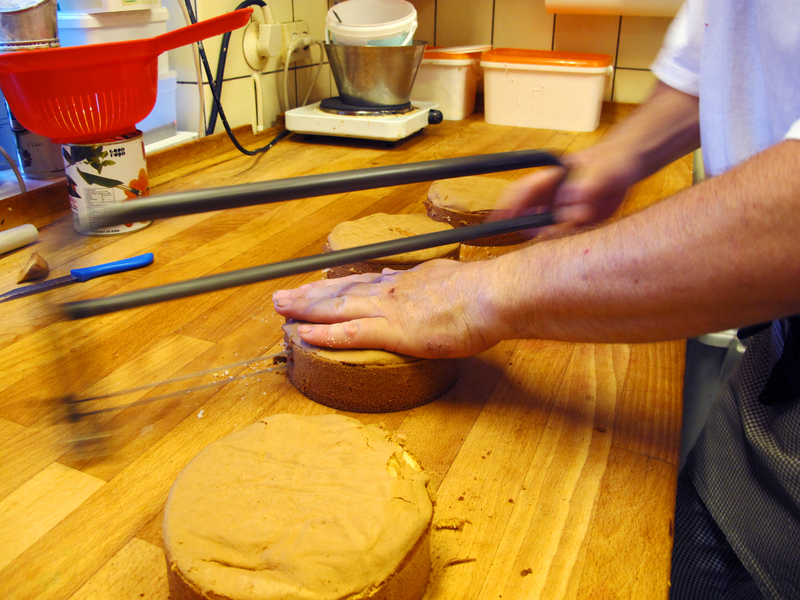 The prinsesstårta recipe only uses the breadcrumbs to dust the pan when making the spongecake. In the U.S. we usually “butter and flour” the pan, dusting it with flour, but in Sweden they typically use breadcrumbs instead of flour. Any fine breadcrumb should work. You could make your own by drying out bread and then blitzing it in a food processor, or if I recall correctly even brands like progresso are quite fine and would likely work for dusting the pan or if it’s part of the ingredients list. Good luck! Enjoyed reading this. 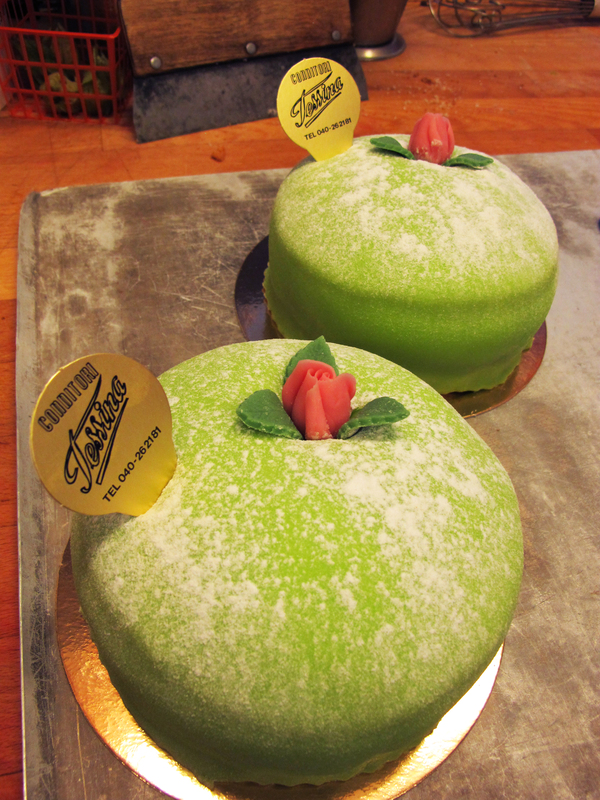 I have seen different names for the different princesscakes such as Operatårta, blåbärstårta, etc. depending on the color of the mandelsmassa and the jam inside. I am not sure if those are official names or not or just the ones that our local bakery uses. What I can’t understand is how they can make the whipped cream and it doesn’t fall or liquify inside the cake, if you know what I mean. Maybe the key is making sure it’s always refrigerated, but when I think about storing fresh whipped cream I’ve made (in the fridge), some of it always liquefies and it seems like that would destroy the princess cake. Hi Alex. Glad you enjoyed the post. I read that the pink prinsesstårta with raspberry jam is called an opera cake, or operatårta, but I haven’t heard of any other “official” names. As far as the cream goes, I do know what you mean about cream liquefying. I think that tends to happens when it isn’t really stiffly whipped. I had some stiffly whipped cream in the fridge from last week that I just tossed and it hadn’t liquefied at all. It does need to be quite stiff to hold up, and the cake absolutely needs to be kept in the refrigerator. I will add that to the post since I realize I didn’t state that. I’ll try to remember to ask if they do anything special to the cream at the bakery. If you whip your cream with light corn syrup, instead of sugar, it won’t separate. I have been wanting to get the Princesses Cookbooks for a while. Could you tell me how many there are in the whole set? Also, could you recommend a website to buy them from? I’d rather have them in the original Swedish than in translation. Tack! There are 4 books in the original series, but I believe that later editions are all one book. The 1952 book I saw was one volume. Here is the site I purchased from. Some of the sellers won’t ship internationally. Google translate is pretty good if you need help with the Swedish, but since you want the books in Swedish, maybe it’s no problem for you. Good luck getting a good set! Thank you! I have been learning Swedish for a while now and a cookery book is really good practice. Thanks a lot for your help. Your post is very thorough and I enjoyed it very much. Incidentally, I’ve just read that Sweden has got a new little Princess! Grattis! We’ll have to try the recipe! I loved reading this–I love your explorations of the history of these foods. What an amazing green color too–I’ve never worked with fondant but it is amazing what you can do with it (or, ahem, the professionals can do). So pleased to have discovered your blog! My Princesstorta for Svenska Klassen turned out well for 1st time.. I used the crumbs instead of flour to coat the pan; I have also used crumbs for brownies and crumb cake. It workes very well. When making the custard I used cornstarch instead of potato flour as I heard It would keep better. I did a test. Part of the custard I used as is; to the other 1/2 I added a cup of the whipped cream. The day after it was made, the regular custard had sunk into the cake, the custard/whipped cream mix looked almost as good as the day before. I had piled the whipped cream on top and had no difficulty topping it with the marzipan. The marzipan I made from a Wilton Cake decoration book receipe, which belonged to my mom. I whipped it with a food processor and it worked up well. Most receipies say to make the Mazipan by hand. I could only find almond paste and not marzipan, so I was glad to find a receipe. The cake was made Friday night and served Saturday morning. The 1st 24 hrs was best. the custard dries more afterward. The whipped cream stood up for the whole time. I whipped it quite stiffly. I was amazed at how the Wh/cream lasted. Our class had visitors. A former class member from several years ago and his Swedish fiance. Boy just add a little stress when giving a project report, not just to the class, but a real Swede. The start of the report I read in swedish, the rest I did in English, no script. My Toast Masters background helped. My cake, plus swedish buns, chocholate and rusks and fish spread equalled a small party. Our Teacher Tuulikki almost always brings coffee. Nice for our visitors and ourselves. It looks AMAZING. I adore marzipan, and the cake is such a pretty confection….YUMMY!!!! Thank you so much. I do think this cake is amazing. If you ever have the chance to try one from a good bakery, I highly recommend it. Making it at home just isn’t the same. I’m so glad you found it. What a nice way to remember your late sister. I hope it is a great success for you and your daughter. Wow! Did you make that prinsesstårta pictured on your blog? Very impressive. I’m glad you enjoyed the recipe and thanks for including the link to semiswede.Ciao! hi i am using the Swedish Princess Cake for my presentation at Johnson and Wales University is it okay if i used your source? of course giving you all the credit? i would really appreciate it ! Of course! Good luck with your presentation, and your degree. This is just what I was looking for! I am head-over-heels for all things Swedish and have been for quite some time now. I’m finishing my undergrad now and am headed to grad school in the fall to study linguistics– with specialty in Nordic languages! I’ll be studying abroad over this summer in Uppsala and I can’t WAIT to go back. Thanks for stopping by and taking the time to comment. Your party sounds like loads of fun. Good luck with your prinsesstårta and your studies. I would love to see pics if you post them and a link would be appreciated. Take care. Thanks so much for posting this! I am going to be making my mother a prinsesstårta for her birthday (which is on Christmas day). She was born in Stockholm and prinsesstårta is her favorite kind of cake. Unfortunately, believe it or not, I could not find a bakery in Manhattan that does these! So that’s why I’ve endeavored to create it myself. I am going to do a full trial run on Friday, using your recipe. I made the sponge cake tonight, and noticed that it did not rise very high (though it tasted pretty good…) I used the exact amounts of all of the ingredients and followed the instructions exactly, except I accidentally used potato flour instead of potato starch. Do you think this could be why it did not rise? The batter went into a 9 inch by 2 inch baking pan as specified and it rose only a little above the halfway point, which doesn’t seem right. I am going to attempt this again tomorrow with potato starch. Also, I didn’t “shake” the baking powder before using it, as I saw it said on the container… I’m pretty new to baking actually, this was my first cake from scratch. I’m hoping to get the cake to rise high enough so I can comfortably cut it into the 3 layers. Again, thanks so much for posting the recipe and history of this fantastic cake! Thanks taking the time to comment Kirsten. I’m about to complete a post about Swedish gift ideas, and that includes a Swedish baking book you might want to consider. The English version is called Swedish Cakes and Cookies and you can find it on amazon.com. I highly recommend it. Have a lovely holiday! Thank you, I’m married to a Swede we live in the states and I’ll attempt to do this recipe for his coming birthday, this summer we’ll go to Sweden for vacation can’t wait!!! Best wishes with the cake! Hope it works out famously for you. It’s definitely not for the faint hearted baker! Thanks so much! I’ve been searching for a bakery that makes these as well as the one from my childhood. Many don’t even know what a princess cake is. Now I get to try my hand at it! You are most welcome! They are not easy to make, but hopefully your efforts will be worth it to bring back some childhood memories. Thank you for the recipe. The local Swedish bakeries have died out and it is impossible to find a Prinsesstarta within 60+ miles of here. I made the Prinsesstarta recipe for a family reunion here in Northern Illinois last evening. Our cousin traveled from Sweden and gave a power point presentation on our Swedish ancestry coming from Falkoping. The cake was wonderful! Many great comments.Thank you again. I had never heard of princesstårta before moving to Sweden. I’m glad to know the cake was a success for you family reunion, thanks for posting! I am of Swedish heritage and my husband use to get the Princess Cake for my birthday when we lived in San Francisco for a Swedish bakery. I now live in Phoenix, Az. and there are no Swedish bakeries here but I would like to try and make one. Do your cook books come in English? I haven’t written and cookbooks. All recipes I have shared are available on this blog, in English. Best wishes if you decide to tackle the Princess Cake. hi! I just made this Sunday and it came out really well. Your cake recipe is fantastic and all the components came together nicely. Homemade marzipan was not hard, the hardest part was the draping. Have you ever tried to freeze leftovers? Thank you so much! So nice to hear this worked so well for you! I have not tried freezing it before, but give it a go and I’d be happy to know how it worked out. I work at a bakery that makes dozens of Princess Tortes every day. Scores on weekends. Thanks for writing such an interesting background story on this popular cake. If your interested in seeing examples of our version, feel free to check my Show and Tell Sunday posts, I often show off decorated Princess Tortes. Reblogged this on Anna loves her blog. 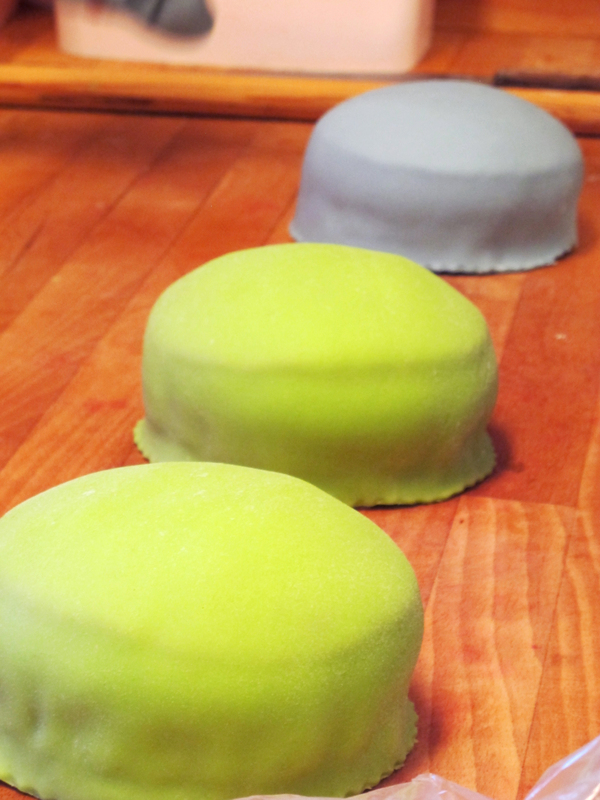 In Sweden, they sell pre-rolled sheets of green marzipan for $2.00 or less. This is their secret on how to make a fast, delicious princess cake! !It comes in a box that resembles foil or Saran Wrap. I had never seen it before, so of course I brought some home!!! I am intrigued by this cake and the history also, it is my absolute favourite. Tack så mycket. Thank you for the interesting read!! Interesting! I have never seen the marizpan sheets here, but am on my way to the store so I will check it out! Glad you enjoyed the post.